I have wanted to learn the art of Dorset button making for some time. 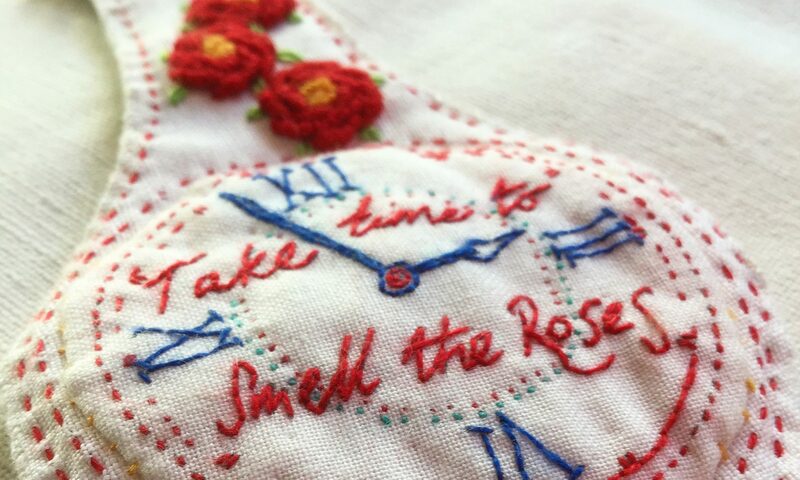 A two hour workshop at my local Embroiderers’ Guild cropped up, and was a perfect excuse to chat with my sewing chums and learn! 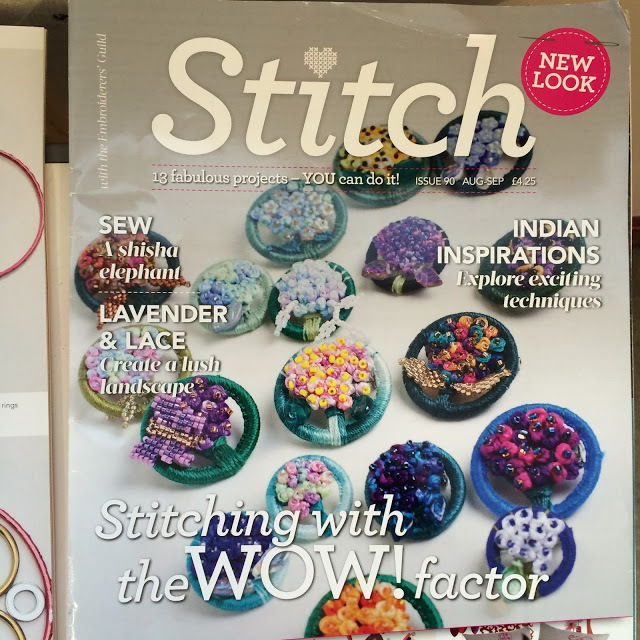 A collection of stunning vintage pieces and a copy of Stitch magazine provided inspiration for our first Dorset Button. So I started my first ever Dorset Button. Any ring made of plastic, bone or metal will do the job perfectly. Perle cotton number 8 thread, a tapestry needle, a brass ring and blanket stitch. This stage was called ‘Casting’. 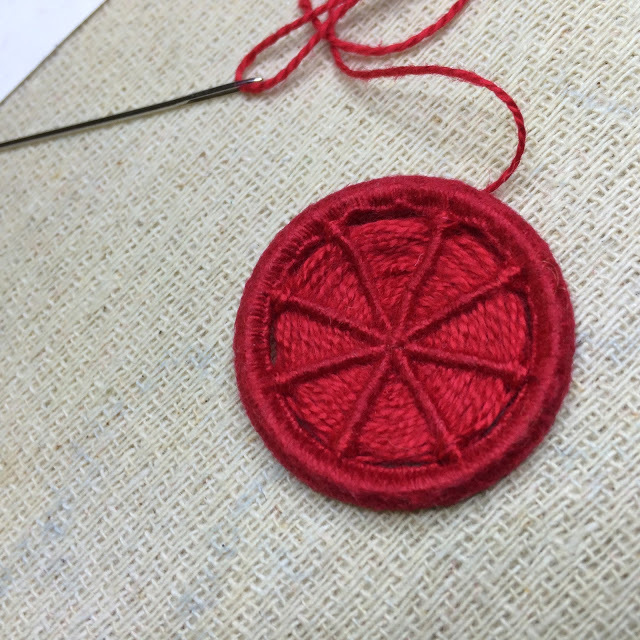 I found out that the thread needs to be longer than you think – enough to finish the whole project. 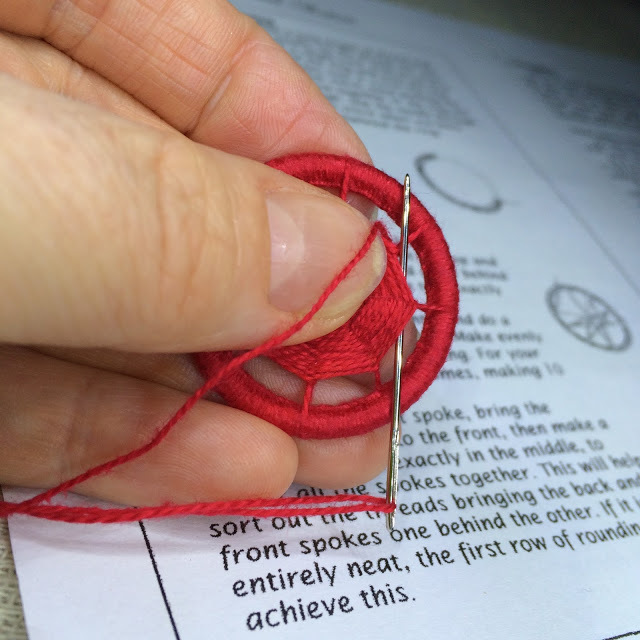 I was recommended 3 arm lengths of thread which was ample for a medium to large size ring. Next came ‘Slicking’. 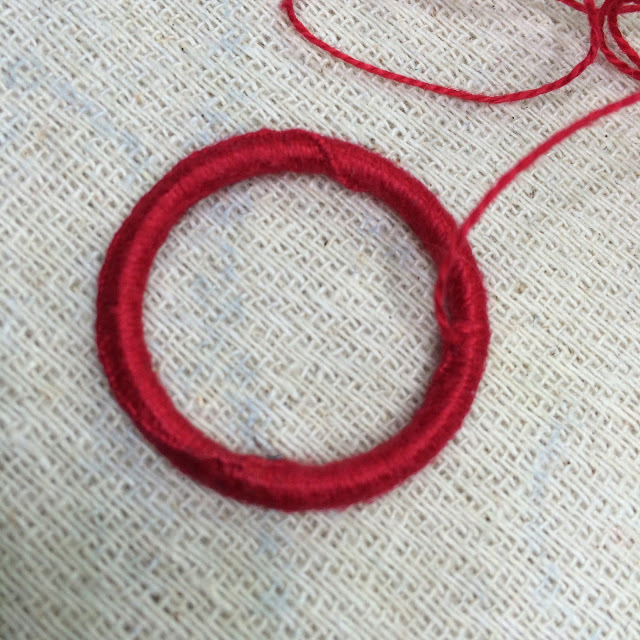 The ridge formed by the blanket stitch was turned to the centre of the ring, making a smooth edge to the ring ready for the next stage. ‘Laying’ was next. 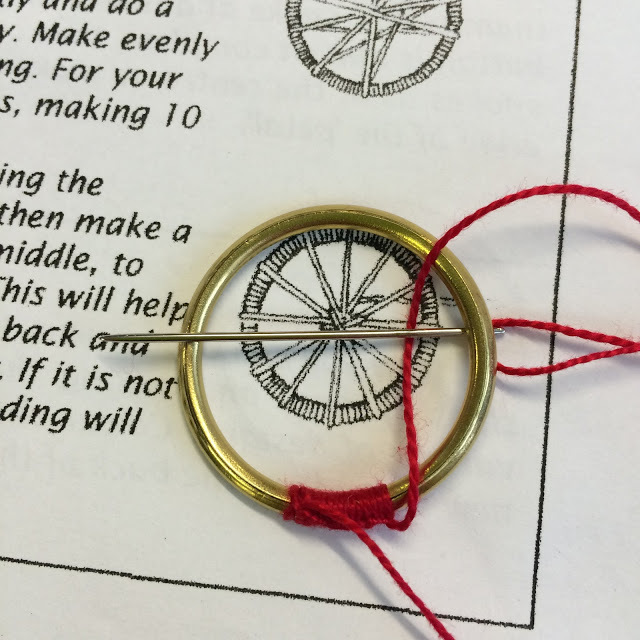 The thread was wound around the ring like spokes in a wheel. 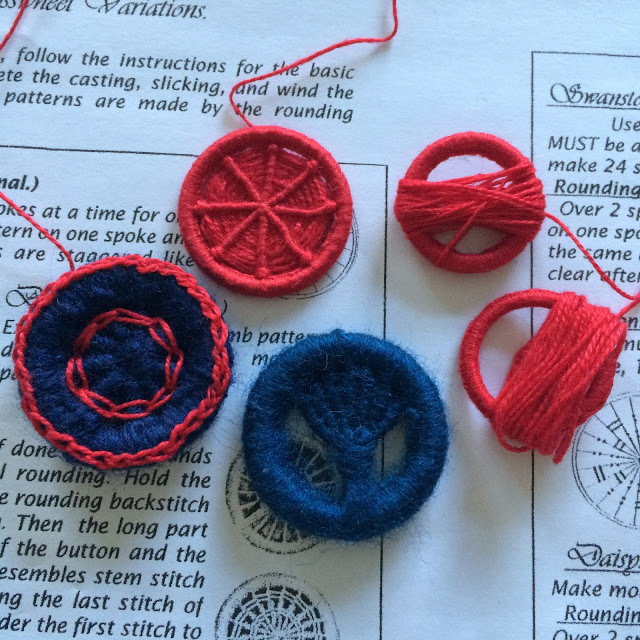 The number of spokes and their position on the ring can vary depending upon the pattern being created. I was making a Dorset Crosswheel so I only needed 8 spokes. 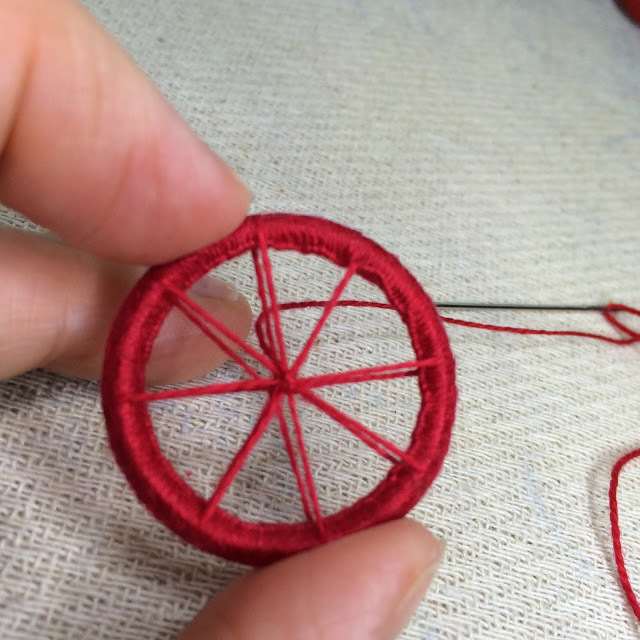 I centred the spokes with two cross stitches before moving onto Rounding. ‘Rounding’ was the final stage. 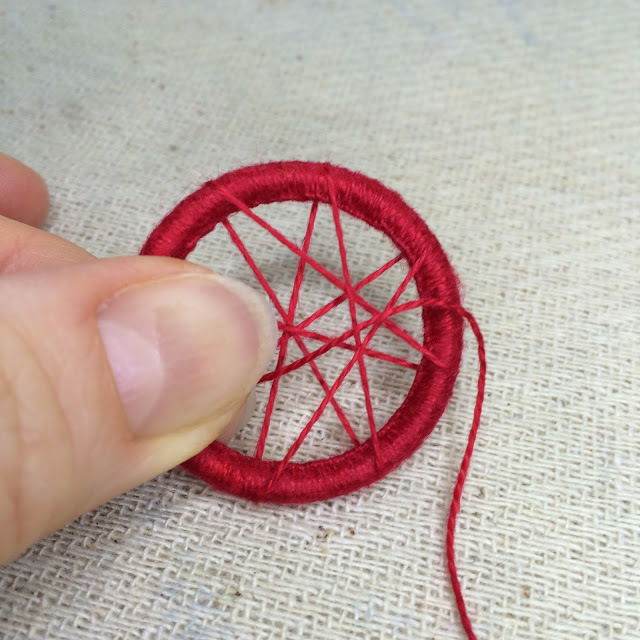 Working from the back of the button, the thread was wound around the spokes in a kind of backstitch effect. 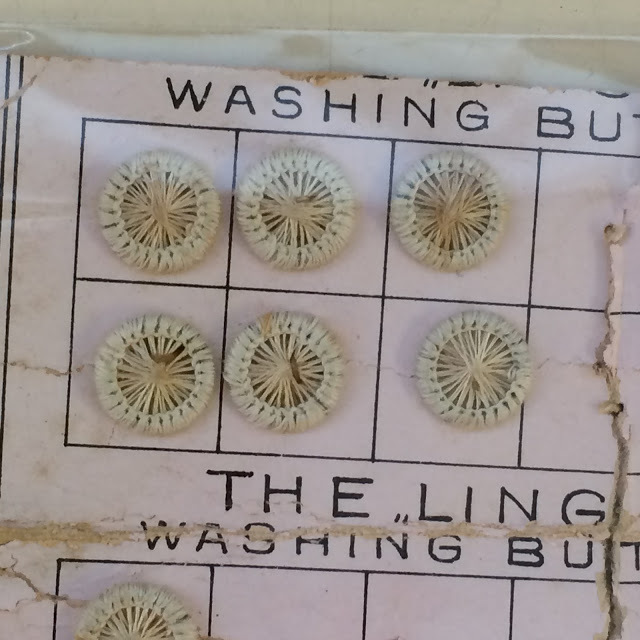 This made the ‘ridges’ on the button front. It was a very therapeutic morning of sewing. I went home and made a few more before the day was over – it’s quite addictive. Dorset buttons are brilliant for embroiderers. Each button has a fabulous textured surface that’s a perfect background just waiting for more decorative stitching. These are some of the pieces made over the weekend of the workshop. They include a few rings that have been Casted and are awaiting the next stage – when I can decide what design to settle on ! I hope this has inspired you to take a look at Dorset buttons and have a go making one. For more information on Dorset Buttons, check out the Gold Hill Museum in Dorset where the famous Hovis Hill is and a collection of original vintage Dorset Buttons can be found. A friend introduced me to Dorset buttons several years and I loved making them from the start. As you say, it is therapeutic stitching. Your first attempt is excellent!